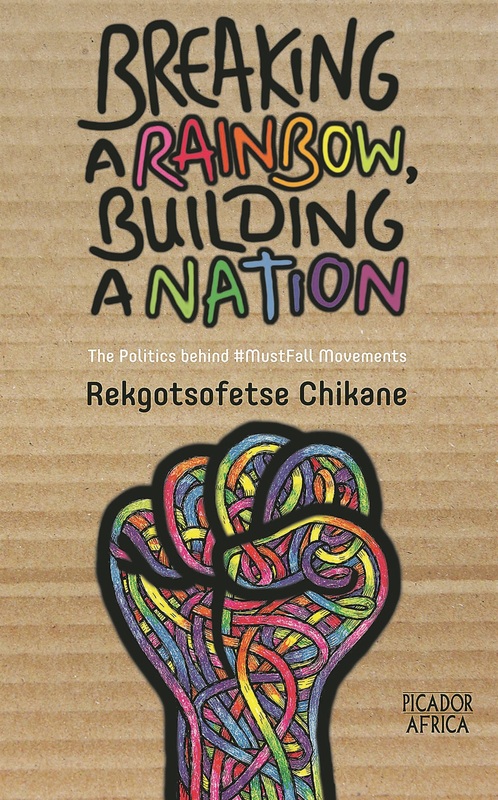 In his debut book, established coconut Rekgotsofetse Chikane offers an interesting but ambiguous narrative of the #FeesMustFall movement. A narrative I don’t happen to relate to a great deal, though as a former student leader and young, poor, black woman I found myself part of the #MustFall history. I’ll admit the title of the book – Breaking a Rainbow, Building a Nation – with the author’s name piqued my curiosity. I was excited that “one of us” had followed through from a conversation that formed a part of the movement’s debriefs: Encouraging the documentation of our movement after realising how our voice was being misrepresented. In the white-owned media there had been a divisive picking of student idols and nonchalant citizens dismissed us as disruptive, ungrateful, privileged and misdirected in our anger towards the state and our institutions. Chikane’s book looks attractive and the index highlights issues many “born-frees” and “woke” citizens are in debate about, including whiteness, institutionalised racism, identity politics and the idea of revolution. From the start the book does well to unpack the rainbow nation as a divisive construct meant to bandage the pain of our continued inequalities. Chikane uses his lived reality to place himself in the movement – that privileged black man who can occupy white spaces as long as his presence is not too disruptive of whiteness. Fair. However, my challenges with the book soon begin in accepting his account and perspective on the role of coconuts in the movement. While Chikane acknowledges it was poor students at historically black universities and technical and vocational education and training colleges that began the movement out of necessity, he does not truly represent or unpack their voices. In centring himself in a subjective coconut narrative, he gives coconuts too much significance and he restores a contested term framed by whiteness – coconut – to a glib prominence I thought we had moved beyond in our discourse. In this way I experienced Chikane’s narrative to be slightly opportunistic, the indulgence of someone in the grip of an identity crisis, seeking belonging – too removed from poverty to be “black” but too black to be co-opted into whiteness. His book made me understand his positionality – but also made me realise how the movement really wasn’t about him and his fellow coconuts at all. Was it really coconuts who drew society’s attention to our plight or was it we who refused them peace in their spaces? For example, Chikane falsely elevates the role of revolutionary coconut Vuyani Pambo, foregrounding him over Nompendulo Mkhatshwa, Shaeera Kalla and Mcebo Dlamini. Sure, the three ANC-aligned leaders faced greater scrutiny than the man in the red beret, but I don’t think Chikane is entirely honest. First, the movement wasn’t just about Wits even though the media loved the story. And second, Pambo was not part of the genesis of the story at Wits. My memory is that he was detached and uninvolved in the meeting that first inspired the movement at Wits. It was Mkhatshwa and Kalla who came back from a finance meeting where fees were tabled that caused the leaders to propose mass action. I found more to learn from and enjoy in the book when it discussed what it meant to be his kind of black in the movement. I also enjoyed the discourse he shared about #RhodesMustFall. What is missing for me is not just the true story of the movement’s origins, but how it ignited the public imagination in 2015 and how this changed in 2016 and last year as people went back to their survival mode and reliance on student loans and scholarships, neglecting the idea of “no student left behind”. Of course, no one story can be the whole story but we must be wary of the reality that it is the privileged, the struggle royalty, the coconuts, who are able to secure the book deals that will write our history.